• The first major UK retrospective of the work of 20th century Dutch artist Maurits Cornelis (MC) Escher opened at Dulwich Picture Gallery in London’s south yesterday following its run at the Scottish National Gallery of Art. The Amazing World of MC Escher showcases more than 100 works – including original drawings, prints, lithographs, and woodcuts – as well as previously unseen archive material from the collection of Gemeentenmuseum Den Haag in The Netherlands. Arranged chronologically, highlights include 1934’s Still Life with Mirror – perhaps the first time the artist used surreal illusion, well-known 1948 lithograph Drawing Hands, the almost four metre long 1939-40 woodcut Metamorphosis II, the 1943 lithograph Reptiles and two of his most celebrated works, Ascending and Descending (1960) and Waterfall (1961). Runs until 17th January and is accompanied by a series of special events. Admission charge applies. For more, see www.dulwichpicturegallery.org.uk. PICTURE: M.C. 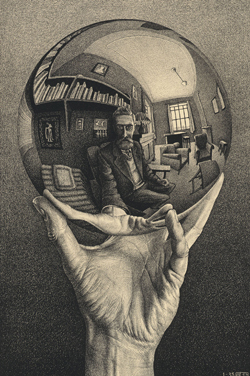 Escher, Hand with Reflecting Sphere (Self-Portait in Spherical Mirror), January 1935, Collection Gemeentemuseum Den Haag, The Hague, The Netherlands/All M.C. Escher works © 2015 The M.C. Escher Company-The Netherlands. All rights reserved. http://www.mcescher.com. • West Africa’s literary history comes under examination in a new exhibition opening at the British Library at St Pancras on Friday. West Africa: Word, Symbol, Song features more than 200 manuscripts, books, sound and film recordings, artworks, masks and textiles taken from the library’s African collections and elsewhere. It explores how key figures – from Nobel Prize winning Nigerian author Professor Wole Soyinka through to human rights activist Fela Kuti, the creator of Afrobeat, and a generation of enslaved 18th century West Africans who agitated for the abolition of the slave trade – used words to both build society and fight injustice. Key items on show include a 1989 letter Kuti wrote to the president of Nigeria, General Ibrahim Babangida, in which he agitated for political change, a pair of atumpan ‘talking drums’ similar to those still used in Ghana, a carnival costume newly designed by Brixton-based artist Ray Mahabir, and letters, texts and life accounts written by the most famous 18th century British writer of African heritage, Olaudah Equiano, enslaved and freed scholar Ayuba Suleiman Diallo, and Phillis Wheatley, who, enslaved as a child, went on to write Romantic poetry. The exhibition, which will be accompanied by a major series of talks, events and performances, runs until 16th February. Admission charge applies. For more, see www.bl.uk/west-africa-exhibition. • Two new war related exhibitions opened in London this week. Opened on Monday at the City of London’s Guildhall Library, Talbot House – An Oasis in a World Gone Crazy, recounts the story of army chaplains Philip ‘Tubby’ Clayton and Neville Talbot and their creation of an Everyman’s Club – where countless soldiers spent time away from the fighting – in a house in the Belgian town of Poperinge, a few miles from the frontline at Ypres. The exhibition, created to celebrate the centenary of the house’s creation in 1915, features items from Talbot House, the memoirs of ‘Tubby’ and part of the hut where he wrote them after fleeing the Germans. Runs until 8th January and the exhibition also features two ticketed events. Entry to the exhibition is free. For more, follow this link. Meanwhile, Lee Miller: A Woman’s War opens at the Imperial War Museum in Lambeth today, displaying 150 photographs depicting women’ experiences during World War II. The four part exhibition looks at women before the war, in wartime Britain, in wartime Europe and after the war. Runs until 24th April. Admission charge applies. For more, see www.iwm.org.uk.